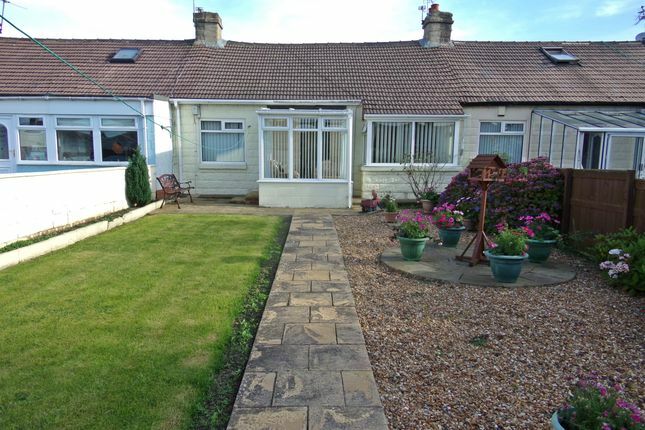 Charming bungalow in popular location...Pattinsn are delighted to offer for sale this two bedroom bungalow, situated on Burns Avenue, in Blackhall, Hartlepool. Benefiting from gas central heating and double glazing, this property briefly comprises: - Lounge, kitchen, conservatory, two bedrooms and bathroom. Externally there is a beautiful enclosed garden to the rear, with lawn and gravel area, plus a paved patio. With no forward chain, this bungalow would be perfect for those looking for a quick sale. Call our Peterlee office now. Double glazed bay window to the front, one double and one single panelled radiator, feature gas fire with wooden surround, TV point and carpet to floor. Fitted with a range of base units with contrasting work surfaces, stainless steel sink and drainer unit with duel taps With an electric cooker point, double glazed window to the rear, double panelled radiator, built in storage cupboard and access to the loft. To the front of the property, with double glazed windows, radiator and carpet to floor. With UPVC door leading to external, carpet to floor and storage cupboard with plumbing and housing boiler. Double glazed window to the front, single panelled radiator, coving to the ceiling, TV point and carpet to floor. Double glazed window to the rear, single panelled radiator, coving to the ceiling, TV point and carpet to floor. Fitted with a three piece suite comprising: - Low level WC, panelled bath with shower over and a hand wash basin. With a double glazed window to the rear, tiling to walls, double panelled radiator and carpet to the floor. To the front is a generous size enclosed grassed garden with a paved patio, gravelled area, shed and flower and shrub border. To the rear is yard.